We can not stress enough of how important an engagement session can be to build a relationship with us before the big day. Couples can get to see how fast or slow we work at times. They get to be comfortable in front of the camera. And they can use their images for save the dates, signing boards, or books, and so much more. Kristine and Dave had a beautiful engagement session. We started off at Forest Lawn Cemetery. Yes, at a cemetery. It is so pretty there and so many places to take photos that do not show tombstones in the image. This image was at Delaware Park. The cherry blossom trees where in bloom. It was perfect timing! This angle was a little different. Neal wanted to shoot through one of the trees and have some of the colored leaves in the foreground. This spot was great because some of the leaves had started to fall and the ground was covered. We had Kristine and Dave lay on the ground. After a little moving around and repositioning we captured this gorgeous image. 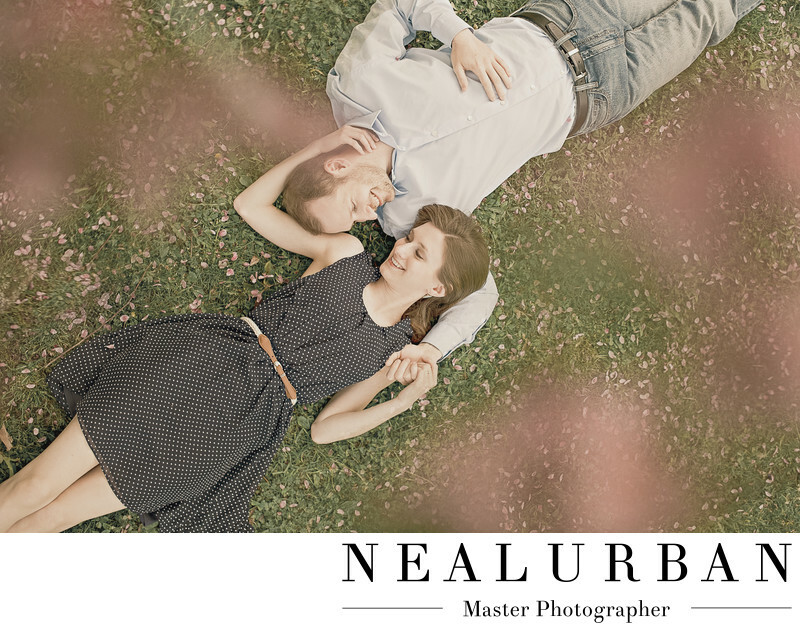 This engaged couple had such nice outfits for the session and complimented each other very well. The color and polka dots on Kristine's dress, paired with Dave's button down, look so good against the grass. The leaves on the ground, almost continue the pattern on Kristine's dress. The expression on the couples faces is awesome. They were having so much fun and this photo captures their personalities! Location: Delaware Park Buffalo NY Unites States.